Subterranean termites or "white-ants" are a fascinating yet highly destructive timber pest, causing major structural timber damage to domestic and commercial buildings in the EASTERN SUBURBS Sydney Region. A major economic pest ✦ we estimate 1 in 4 properties in the EASTERN SUBURBS Sydney Region have a termite problem ✦ that's why it's mandatory for home-buyers to get a pre-purchase Timber Pest Inspection Report to AS.4349. Most homes are at high risk particularly where well established gum trees are within a 100 metre radius of the building ✦ the wide use of landscaping timbers and garden mulch greatly increases the risk ✦ many older style homes, with timber flooring, built low to the ground, with poor ventilation are also at high risk of a serious termite infestation. Subterranean Termites are known to destroy the wall and roofing timbers of a home within 3 months of construction. Subterranean Termites cause more damage to homes in Australia than fire, floods, storms and tempest, combined. Subterranean Termites occur throughout the entire EASTERN SUBURBS Sydney Area with a higher incidence of attack in built-up urban areas - particularly where large eucalyptus gum trees are prevalent. Consumer Note: Your Home and Building Insurance Policy will NOT cover the repair costs of termite infested structural and decorative timbers. Your best protection is a soil treatment around the base of the building ie Termite Preventive Barrier AS.3660 using TERMIDOR Termiticide. Picture on the left shows a FUMAPEST termite inspector examining a large subsidiary nest inside the dining room wall cavity of a home. Above ground nests Termites often build such above-ground nests provided a reliable moisture source exits, such as, from faulty plumbing, leaking pipes, shower recess, guttering, broken roof tiles and the like. Mud shelter tubes - picture on left shows a termite mud shelter tube built over a brick foundation wall to the flooring timbers in a sub-floor. Termites are very secretive and will often enter a building through areas inaccessible to inspection, such as, via on-ground patios, cracks or expansion joints or around concrete slab flooring, particularly if the slab edge is obscured by pathways or garden beds. Tiny entry points Termites can enter a building through a 2mm crack in concrete slab on-ground flooring and eat through the rubber compound between adjoining concrete slabs. Termites can travel under parquetry and floor tiles to get to wall and roofing framing timbers.
. Workers feed the colony: Only worker termites can digest timber by use of symbiotic protozoa in their gut. The worker termites digest and then regurgitate the partly digested timber as a semi-liquid food for the other termite castes. 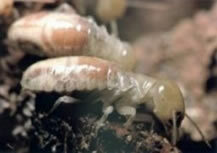 Even the workers excrete is eaten by other termites as it high in cellulose content. Modern termite control products take advantage of mutual feeding and grooming habits of termites to kill the entire colony. Termite Baits - Transfer Effect - Worker termites ingest the termite bait and transfer it back to central colony nest to feed other termites therein - with sufficient termites ingesting the bait, the queen is killed - then total elimnation the colony is virtually certain. 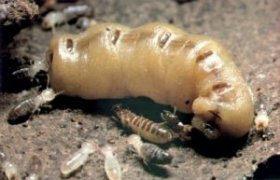 Cannibal like efficiency: Worker termites cannibalise other dead termites, which if they carry the termite bait in their system, will kill those termites and further hasten the demise of the termite colony. Fascinating biology: Australian termites evolved more than 250 million years ago - long before flowering plants. Their survival success depends on living in a protective underground environment. In some species, their colony nest has a hardened shell, exposed above-ground. In most destructive species in NSW their nest is subterraneam totally out of sight, below ground level. Worker termites build mud-tubes over hard objects. The tubes or "galleries" are made up of partly digested timber and mud excrete, and is moist if in active use. 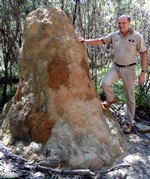 The termites keep it's colony nest and galleries at 25 to 35oC with high humidity. Termites will dehydrate if exposed to light or open air. Subterranean termites live in constant darkness, excepting for the annual summer swarms of the winged reproductives to set up new nests in the surrounding area. A million termites in the colony nest: In some destructive species, a termite colony nest may contain more than a million termites, consisting of a queen - king - young immature nymphs - workers - soldiers - winged reproductives (alates). Termites are delicate, soft bodied and small in stature, about half the size of match-head, but are highly efficient timber recyclers and renown as Mother Nature's best builders. The worker termites are blind and forage in a largely random criss-cross fashion looking for new timber food sources. However, they may encounter and follow moisture zones and trail along solid objects, such as, the concrete slab edge of your home. The soldiers accompany the workers in their constant search for new timber food sources. If you find termites active in timber framing, it is the soldiers that rush out to defend the workers. Termites live in underground nests and travel in mud tubes to protect them from ants their arch enemy. Termites descended from the cockroach family - ants from the wasp family. Ants will not protect you from termites: The soldier termites has a hard helmet-style head with large cutting pincers and a frontal pore to squirt sticky latex to ensnare the ants. Interdependent social structure: The termite colony has a king, queen, winged reproductive (young kings and queens), soldier and worker termites. Each has a different role to perform and all interdependent upon each other for survival of the colony. Termites constantly groom and feed each other. A valuable technique for the termite controller is to install and monitor a termite baiting system next to any live activity found in and around the premises where termite foraging is most likely to occur. Subsequent regular inspections indicate the amount of bait consumed and the condition of any termites observed. They may appear sick, exhibit a change of colour to a mottle look, indicating the effect of the termite bait over time. If you find termites - do NOT disturb them - Termites have acute survival instincts - if shaken up or disturbed, the termites will abandon the area and move other areas in the building. If you find termites in or around your property - do NOT disturb them - promptly arrange for a professional FUMAPEST inspection and use of termite bait to the live termites, if present in abundance. Queen termite is an egg laying machine; her body is enormous compared to her off-spring; she can live more than 25 years and produce more that 2,000 eggs a day. King termite stays by the side of the Queen all it's life locked away in the central nursery chamber tended to by worker termites, around the clock. Worker termites are most numerous in the termite colony. They are usually about 3 to 4 mm long, soft bodied, creamy translucent colour, have no wings, are sterile and blind. Busy 24/7 Worker termites carry out all work in the nest, including food gathering, building, repairing and maintaining the colony nest structure and foraging tunnel system. Only the workers can digest timber which they regurgitate and feed in liquid form to the queen and other termites in the colony. Soldier termites commonly have an orange coloured armored head with mandibulate pinchers which they use to crush an attacker, such as ants; some have hard pointed snout which eject a white sticky latex to ensnare their enemies. Soldier termites are often seen in large numbers when an active shelter tubes or damaged timber, is opened. Soldier termites will rush out to guard the opening whilst worker termites repair the breach. Alates or winged reproductives are commonly seen when they swarm on a hot humid summer evening around dusk, often in their thousands from a large mature colony nest. Unlike the other caste, they have eyes but are , are poor fliers. The hover and are swept along by prevailing winds. The swarmers when they land, they drop their wings, and use a pheromone chemical signal attract a mate to start up a new colony of termites. WARNING: If you find swarming termites, it is a sure DANGER sign that a large termite colony nest is close-by, and your home is at high risk of a severe termite infestation. The main destructive species of termites in the EASTERN SUBURBS Sydney Area. Proper identification is essential: Some species of subterranean termites prefer to attack living trees and will not eat dry seasoned timbers in a building, whilst others can be are highly destructive to such buildings. Coptotermes acinaciformis - commonly found in the EASTERN SUBURBS Sydney Region - particularly in built-up urban areas - under concrete on-ground flooring and in areas where eucalypt gum trees are prevalent. Destructive Nature - Coptotermes acinaciformis are highly destructive to buildings and other timber structures. The most widely distributed and destructive timber pest in the region - accounting for more than 70% of the serious damage to buildings. A single colony may consist of more than one million termites. A most voracious timber pest ... one to be taken seriously. Nest Location - Coptotermes acinaciformis - very secretive termite species; they build their nest out of sight, often within the base of eucalyptus or other susceptible trees, or completely under the ground; often within an enclosed patio or under concrete on ground flooring which is ideal for moisture retention, temperature and humidity control within the termite colony's central nest. Coptotermes acinaciformis can also construct subsidiary termite nests away from the main colony nest. 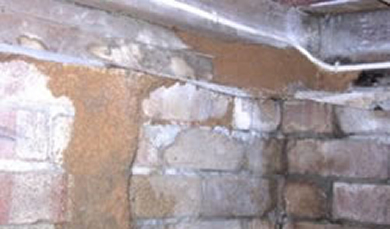 A subsidiary termite nest can be contained in a wall cavity of a building where there is a reliable moisture source, for example, from a leaking shower recess or faulty guttering or rusted down pipes. Schedorhinotermes intermedius are commonly found in the EASTERN SUBURBS Sydney Region and areas of coastal NSW. Identification - these termites "gouge" the affected timber - has a fetish around nails used in construction. When you first find them, you will often see a major soldier (6mm in body length) and a minor soldier (4mm in body length). Destructive Nature - Schedorhinotermes intermedius are highly destructive to buildings and other timber structures. If mostly major (larger) soldiers are sighted, it is most likely a large colony with the potential to cause severe and rapid damage to structural timbers of a building and timber structures. Nest Location - Schedorhinotermes intermedius commonly build their nest in tree stumps, in the root crown of the living, dead and debilitated trees, under houses or within enclosed patios or other areas where timber has been buried or stored in contact with the soil. Coptotermes frenchi are commonly found in the EASTERN SUBURBS Sydney Region and other areas of NSW - particularly in built-up urban areas, where homes and buildings are constructed of softwood or oregon timber framing. Destructive Nature - Coptotermes frenchi can cause severe damage to buildings and other wooden structures. It is common for this species to devour timber framing leaving only a thin veneer. This species is the most shy of the destructive species; they will retreat from a location immediately (for the time being) if disturbed. Nest Location - Coptotermes frenchi most often build their nest in the root crown or lower trunk area of living trees, particularly eucalypts. They may also build their nest as a mound in the dryer areas. Nasutitermes exitiosus are commonly found in the EASTERN SUBURBS Sydney Region and other areas of NSW - particularly in built-up urban areas or where eucalypt gum trees are highly prevalent. Destructive Nature - Nasutitermes exitiosus are destructive to buildings and other timber structures. Sometimes severe damage may occur, but not so commonly as the other species listed above. Nest Location - Nasutitermes exitiosus build a mound nest which protrudes 30cm to 75cm above ground. The observed nest can be treated with Termidor Termiticide for total colony elimination. Coptotermes lacteus are found in the EASTERN SUBURBS Sydney Region and accross eastern NSW - particularly prevalent along the entire coast-line, along the Great Dividing Range and western slopes. Destructive Nature - Coptotermes lacteus attacks stumps, dead trees, timber fences, poles and other timber structures that are in contact with the soil, being softened by weathering or decay. These termites are also known to attack such timber in damp sub-floor areas. Nest Location - this termite species, most often builds it's nest as a mound up to 2m above ground level, with hard clay walls - to eradicate the colony - treat with Termidor Termiticide. Nasutitermes walkeri are commonly found in the EASTERN SUBURBS Sydney Region and other coastal and mountain regions along the eastern side of NSW. Destructive Nature - Nasutitermes walkeri can be destructive to damp timbers often a serious problem where the sub-floor of a building is damp and ventilation is poor with resulting wood decay or fungal growth. Nest Location - Nasutitermes walkeri build a nest in trees on the main trunk or in fork of large branch. Heterotermes ferox commonly found in the EASTERN SUBURBS Sydney Region and other areas of NSW particularly where eucalypt gum trees are highly prevalent. Destructive Nature - Heterotermes ferox prefer damp timbers, fences and poles with wood decay. Often confused with the more destructive Coptotermes acinaciformis species. Nest Location - Heterotermes ferox often build their colony nest next to stumps, logs, or other timber in direct contact with the soil where some wood decay or rotting is prevalent. Dampwood termites form small independent nests; they feed on sick or dead trees, decaying decaying wood in the ground or in buildings and fences; they are seldom found in dry timbers in buildings; and are normally larger in size than other termite species. Area of Distribution - Dampwood termites are found across highland and coastal Victoria, NSW, Queensland, NT and SA. Drywood termites occur mostly in tropical areas, where the atmospheric humidity is constantly above 75 percent. Cryptotermes brevis - the introduced and highly destructive West Indian drywood termite, is rarely located in Australia. Specialist eradication procedures involve wrapping the entire building in plastic and using methyl bromide fumigation.